Calculations suggest that complexes of borane with N-heterocyclic carbenes (NHC) have B−H bond dissocation energies more then 20 kcal/mol less than free borane, diborane, borane−THF, and related complexes. Values are in the range of popular radical hydrogen atom donors like tin hydrides (70−80 kcal/mol). The resulting prediction that NHC borane complexes could be used as radical hydrogen atom donors was verified by radical deoxygenation of xanthates by using either AIBN or triethylborane as initiator. Iron(II) complexes such as FeCl2, FeCl2(dppe)2 (1,2-bisdiphenylphosphinoethane) associated with sodium borohydride (NaBH4) are efficient precatalysts for radical cyclization of unsaturated iodide and bromide derivatives. As evidenced by cyclic voltammetry studies, a radical mechanism is at work which involves an anionic hydrido-iron(I) species as the key intermediate for the activation of the substrates by electron transfer. Triarylsulfonium salts are prompted to undergo efficient homolytic reduction by single electron transfer under mild photocatalytic conditions. The liberated aryl radical can then participate in carbon-carbon bond formation with allyl sulfones and activated olefins. Triarylsulfonium salts emerge as a valuable and alternative source of aryl radicals for synthesis. 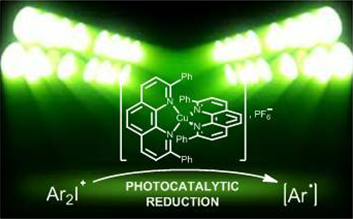 The photocatalyzed reduction of diaryliodonium salts is reported by using [Cu(dpp)2]PF6 as photoactive complex and DIPEA as reductive quench. This novel application of a copper catalyst allows to generate aryl radicals under mild conditions and keeps them reactive in C-C bond formation processes. 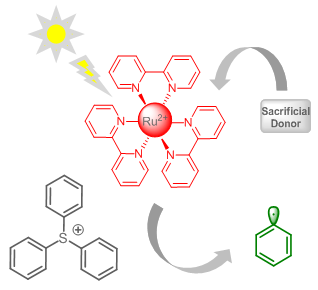 Visible-light photocatalytic oxidation of 1,3-dicarbonyl compounds, using Ru(bpy)3Cl2 as a photocatalyst and combining molecular oxygen and triphenylcarbenium as a new sacrificial acceptor, has been developed for carbon-carbon bond formation giving access to dimerization, allylation and polycyclization products. The Barton–McCombie deoxygenation is one of the most important transformations in the toolbox of organic chemists which has been the subject of a number of methodological developments. 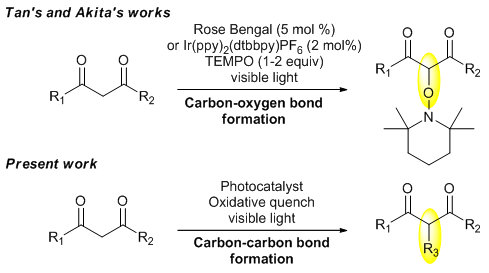 In this study, we report a photocatalyzed redox deoxygenation of secondary and tertiary alcohols from thiocarbamate precursors under visible light activation. The iridium complex Ir(ppy)3 proved to be the most efficient catalyst in the presence of Hünig’s base as sacrifial electron donor. A mechanistic investigation is presented based on fluorescence quenching experiments and cyclic voltammetry. Two natural quinazolinones and two analogues can be prepared from the cascade cyclizations of alkyl-substituted N-acylcyanamide radicals, including 5-exo-dig or 6-exo-dig cyclizations onto the cyano group, followed by radical arylations of the resulting amidyl radicals. The fact that one can carry out the cascades from alkyl radicals in addition to aryl, vinyl and aminyl ones, shows the versatility of the method to rapidly access nitrogen-containing polycyclic structures. A newly designed radical cascade involving N-acyl cyanamides is reported. It builds on aromatic homolytic substitutions as intermediate events and leads to complex heteroaromatic structures via an unprecedented radical migration of a substituent on aryl groups of quinazolinones (hydrogen or alkyl). Mechanistic considerations are detailed, which allowed to devise fine control over the domino processes. The latter could be predictably stopped at several stages, depending on the reaction conditions. Finally, a surgical introduction of a trifluoromethyl substituent on a quinazolinone was achieved via the reported migration. Additions of nitrogen-centered radicals to cyanamides provide the first radical synthesis of aromatic polycyclic guanidines. Modular assembly of the substrates allows rapid increase of the molecular complexity of scaffolds with potential applications for medicinal chemistry.